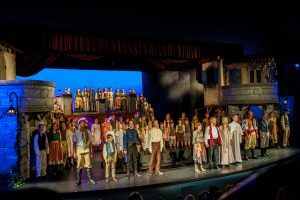 Les Miserables performed in June, 2016. Les Miserables teaches so many lessons in just 2 1/2 hours! For my vision, I used the quote above as our focus for this production. So many people yearn to be seen for who they really are in their most miserable moments. And when some one does truly see them and shows them charity, these are the moments of Les Miserables. In 2012, I used a beautiful red scarf to punctuate these moments. This production will also have its own red scarf being passed from character to character in moments that they are loved and shown this mercy. My wish for this cast has been that they will take this lesson of Les Miserables and try to see others with this same kind of love; truly love others for for exactly who they are. Wow! What an amazing opportunity to discover this beautiful musical with another group of talented youth! It has been an amazing journey with a superb production team gently guiding the youth to their greatest potential. A special thanks to the cast, crew and orchestra; you are a gift to direct! I would like to thank my incredible family for playing so much with me in theatre; you are my greatest joy! And a very special thanks to Erin for seeing me as I need some one to see me; you are a wonderful partner in theatre and a true friend! Now… please enjoy every moment of Les Miserables!